Open weekend Sat/Sun, 7th/8th October 2017 (10-3 both days). Access all areas, wagon & engineering shops, see the historic colliery wagon collection, see our resident steam and industrial diesel locomotives including the Port of Sunderland's Ruston diesels "Pinky" & "Perky". Bowes model railway running, blacksmith at work in the tub shop forge, guided tours and light refreshments available in the "kip & dish" cafe. Open weekend Sat/Sun, 2nd/3rd September 2017 (10-3pm both days). View the historic site and engineering shops, wagon repair building, amazing colliery wagon collection, resident steam and industrial diesel locomotives including Port of Sunderland Ruston's "Pinky & Perky". Bowes Model Railway running, blacksmith at work in the tub shop forge, guided tours, light refreshments available. 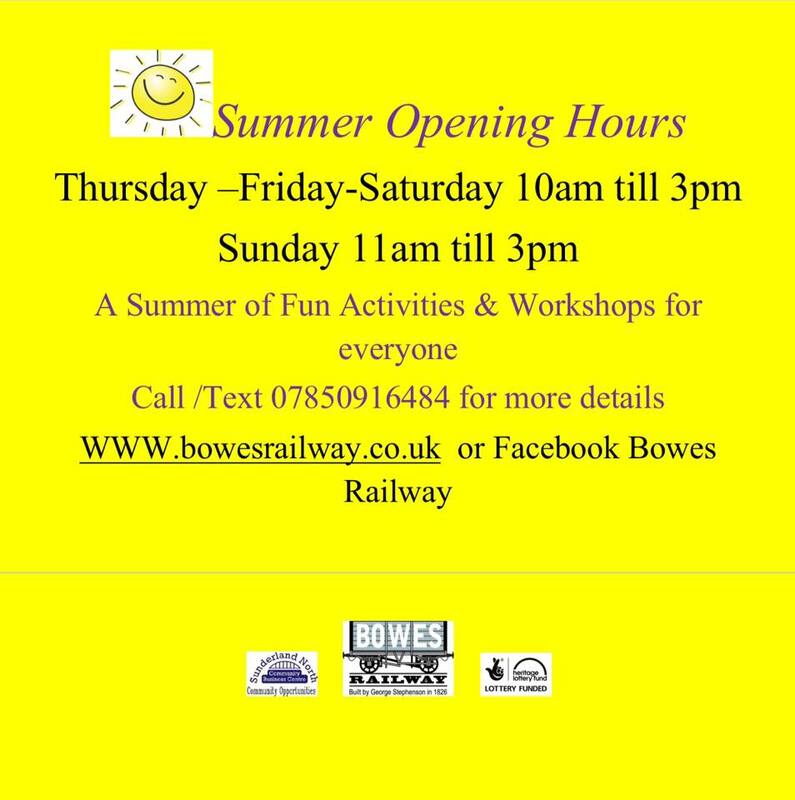 As part of the countrywide programme of events associated with our National Heritage, Bowes Railway is open for the four special days. Guided tours including visits to the Blackham's Hill Hauler house and winding engine. Tours of the historic Springwell site much of which dates back to 1826, also visits to the refurbished wagon repair shop. View the splendid colliery wagon collection, underground mining equipment and locomotives, resident steam and industrial diesels. Blacksmith working in the forge, engineering workshops and machinery can be seen. Vintage bus link operating between this and other transport/colliery attractions. Refreshments available. Ring for details/times regarding tours to Blackham's Hill hauler house. If you are interested in learning some of the blacksmith's amazing skills please contact the telephone numbers on the poster. See some fantastic models built from this popular constructional "toy" developed by Frank Hornby, who also made model trains, boats and the famous "Dinky" toys. Opportunity for children to make simple Meccano models. Site open for viewing as normal, miniature train rides, Bowes model railway operating, help make a "model train" and refreshments available. See the historic wagon collection, mining related artefacts, underground locos, guided tours will be given, resident diesel locomotives on shunting duty in Springwell Yard, and the Bowes model railway working . Refreshments Available. Springwell Village 1940's Weekend 30th June and 1st/2nd July. Bowes Railway were pleased to support Springwell Village in their 1940's event. There were firing displays and battle re-enactments. A staged children's evacuation train was steam hauled into the platform where they were given their ration books and typical wartime provisions. Sadly it was the last steaming for Barclay No 22 (AB 2274/1949) which has been withdrawn for new boiler tubes and to be re-tyred.